It’s a magical time at Princess Party Perfect and Kaleidoscope. After a lot of hard work and great demand the fairies have arrived. 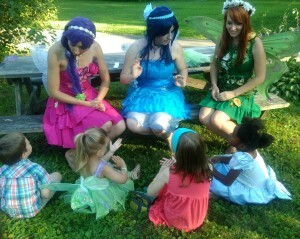 All our fairies are trained actresses who come in character and stay in character for the entire length of your event. They’re elegant, silly and fun. They’re great for toddler parties, birthday parties and corporate events and an amazing source of entertainment for kids. What is to be expected when our fairies land at your party/event? If there are add-on included in your package your entertainer will come in a few minutes early to set up. If possible or requested they’ll be more than happy to do a grand entrance for your guests. They’ll jump right into fairy themed games with the kids. Yes you can take a lot of pictures! We always provide a photo opportunity with the characters. All our packages are customizable to fit all types of fairy themed parties (garden fairy party, Tinkerbell and friends, pixies and pirates, etc). All you need is some trust and faith and we’ll bring the pixie dust. A birthday is a magical and special day for any child. Maintain that magic and our fairies will help you along with it. Check out the video below for an idea of what’s it’s like to have us at a party! We can’t wait to party with you all.